New research conducted by Time to Change shows the barriers preventing men in particular from talking about how they are feeling. This includes negative attitudes to mental health and a lower likelihood of discussing problems with a professional than women. When added to the fact that men are three times more like likely to take their own life the reality of these issues become far more urgent. Suicide is the biggest killer of men under 45. I recently met Oli, an actor, vlogger and Time to Change champion to discuss these issues. Oli was only nine when he first noticed “something wasn’t right” and during his teens things took a turn for the worse. He experienced depression, increasingly manic phases and sadly attempted to take his own life on two occasions. During an episode of acute crisis, Oli ended up in a police cell. This tale is far too common - 50% of adults with Mental Health problems experience diagnosable symptoms before they reach the age of 15. 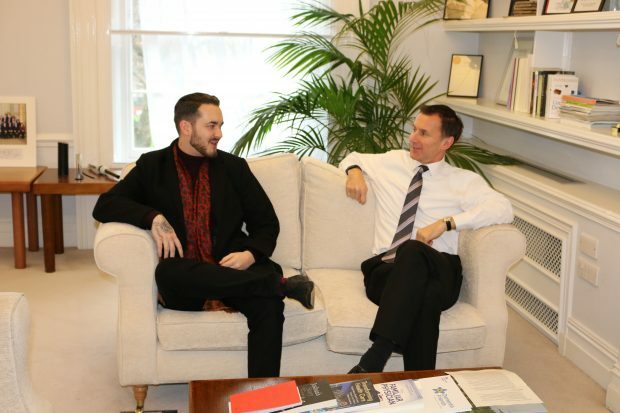 Oli told me how he felt he couldn’t speak to anyone during his struggles with mental health – he came from the male-dominated construction industry, where discussions about mental health were unwelcome – and yet suicide accounts for ten times more deaths than falls taking place on sites. “Just man up,” or “sort yourself out” were the typical responses. Oli’s struggle is all too common - Time to Change have highlighted that only a third of men (34%) would talk openly about their feelings and 31% would be embarrassed about seeking help for a mental health problem. The launch of today’s campaign helps to address this issue. Men are urged to “be in your mate’s corner and change a life.” Taking the time to have personal contact with someone makes a difference – it can be as simple as a chat over a coffee or a text message to check how somebody is doing. As a government, we want to help get this issue out into the open – but in truth, we can’t do this alone. This is a problem that as a society we must tackle together – everyone has a role to play in reaching out to people in their communities who may need support. Our recently updated suicide prevention strategy targets men as one of these groups at risk of taking their own lives or self-harming. We have given record investment to transform mental health services, including liaison and crisis care. Although this is excellent progress we must also focus on breaking down stigma and raising awareness of mental health issues in men, supporting the excellent work that Time to Change are launching today.